Traditional lacquerware, or Yun De as it is known in Burmese, has its own unique style. The art form, also known as Pan Yun, appears to have originated in Bagan around the 12th or 13th century and the ancient capital remains the center for the traditional Burmese lacquerware industry today. There you can find large workshops where teams of artisans still practice the handicraft although interest in lacquerware among the locals is slowly declining. “The traditional lacquerware art has existed since the Bagan era and it’s over a thousand years old. It is also a traditional family business that has been passed down from generation to generation. 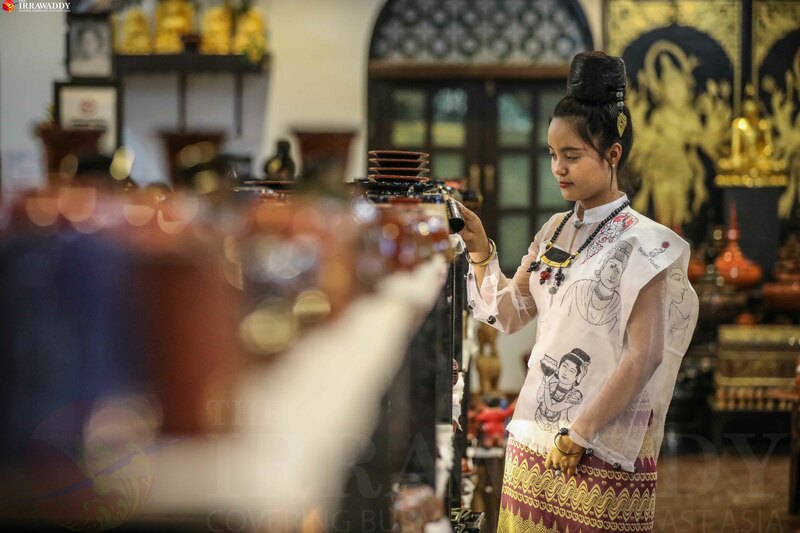 So, I would like to attract the next generation to be interested in it as well,” said Daw Maw Maw Aung, the owner of the Bagan House lacquerware shop. “But the new generation is mostly interested in the latest technological gadgets and they are forgetting to value traditional things. They just want to spend their money on luxury goods,” she added. The process of making Burmese lacquerware is not easy. There are a lot of steps and it requires teamwork. One single person can’t handle the whole process and it takes between six months to a year to complete one item. So, the products are not cheap. “That’s one reason that local people stopped buying lacquerware. It’s expensive but it is our intangible cultural heritage,” Daw Maw Maw Aung said. Nowadays, a lot of lacquerware shops depend on foreigners and the hotel decoration market to drive demand, Daw Maw Maw Aung said. Bagan House creates fashion accessories like bracelets, rings, necklaces, and scarves painted with the sap (Thit Si) used in making lacquerware. The store owner organized an event to showcase the shop’s products and activities on April 29, the full moon day of Kasong. At the event, girls wore traditional dresses with the Bagan House’s lacquerware fashion accessories and scarves. The designs are not too modern but look classic and gorgeous. Some accessories are too big and not really suited to wear to an everyday event. “Yes, we are trying to attract local people but we can’t forget about the foreigners. So, we make designs that might appeal to both locals and foreigners,” Daw Maw Maw Aung said. The basic dried lacquerware color is black and it is turned into art with the use of needles to make etchings and the addition of some other colors such as red, green and yellow. “Myanmar traditional lacquerware has only four colors. We don’t have too many techniques to get the color powder but we can buy some from Japan and other countries that also have a lacquerware tradition,” Daw Maw Maw Aye said. The price of lacquerware fashion accessories ranges widely and depends on the item. A bracelet costs only 4,000 to 5,000 kyats while a necklace can go for between 20,000 to 40,000 kyats. 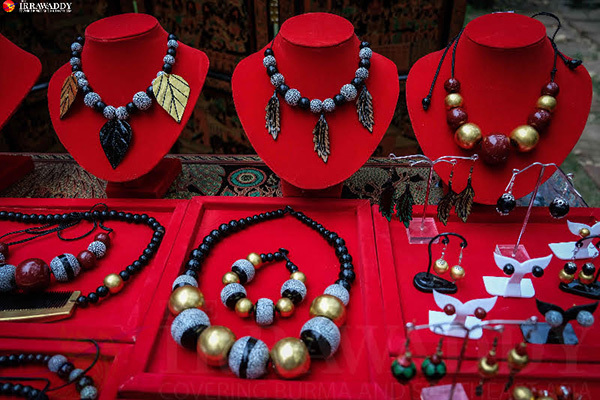 “We are trying to produce more accessories and come up with cool designs that might appeal to local people,” Daw Maw Maw Aung said. So, if you are a fashion lover, proud to wear traditional things on your body, Bagan House is the place you should while visiting Bagan.